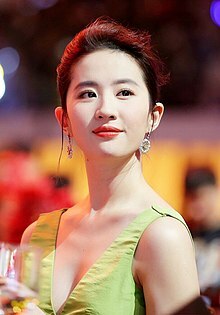 Crystal Liu (born An Feng; August 25, 1987), better known as Liu Yifei (Chinese: 刘亦菲, pronounced [ljǒu̯ î féi̯]), is a Chinese American actress, model and singer. Liu is widely known as "Fairy Sister" in the entertainment industry for her sweet and delicate image. In 2009, she was named as one of the New Four Dan Actresses in China. In 2017, she was cast as the lead in Disney's live-action adaptation of Mulan. Liu was born in Tongji Hospital in Wuhan, Hubei and her birth name was "An Feng". She is an only child. Her father is An Shaokang (安少康), a 1st Secretary in the Chinese Embassy in France and a French language university professor, while her mother is Liu Xiaoli (刘晓莉), a dancer and a stage performer. Her parents divorced when she was 10 years old and she was raised solely by her mother. That same year, she adopted her mother's family name and changed her name to "Liu Ximeizi" (刘茜美子) and began modelling, along with training in singing, dancing and playing the piano. Her godfather is Chen Jinfei (陈金飞), the Chairman of Beijing Tongchan Investment Group (北京通产投资集团). When she was 10 years old, Liu and her mother moved to New York City, where she attended Louis Pasteur Middle School 67. She lived in Queens before returning to China in 2002 to pursue an acting career and changed her name to "Liu Yifei" (刘亦菲). While living in the United States, she gained her United States citizenship. Several weeks later after returning to China, Liu was accepted into the Performance Institute of Beijing Film Academy at the age of 15, and graduated in 2006. Immediately after her admittance into the Beijing Film Academy, Liu Yifei received offers to star in various television series. Her first television appearance was in the period romance drama The Story of a Noble Family (2003), based on Zhang Henshui's novel of the same name. The series achieved the highest ratings on CCTV, and positive reviews from audience. The same year, she was chosen by Zhang Jizhong to play Wang Yuyan in Demi-Gods and Semi-Devils, an adaptation of Louis Cha's wuxia novel of the same title. The series was broadcast in Taiwan and achieved a rating of 5.69, becoming the highest-rated Chinese drama in Taiwan. Liu's role as the beautiful Wang Yuyan earned her the nickname of "Fairy Sister" by the media and fans. In 2005, Liu starred in Chinese Paladin, a fantasy action drama adapted from the role-playing game The Legend of Sword and Fairy. The drama earned a cult following, and solidified her popularity in China. In 2006, Liu was chosen to portray Xiaolongnü in The Return of the Condor Heroes, based on Louis Cha's wuxia novel of the same title. Liu's casting was backed by Cha himself, who felt that she had all the necessary qualities to portray the young and innocent female protagonist. After the drama aired, Liu gained acclaim for her performance and swiftly experienced a surge in popularity. The same year, she was chosen as the "Golden Eagle Goddess" at the 6th China Golden Eagle TV Art Festival. After achieving success in television, Liu then ventured onto the big screen. In 2007, she joined William Morris Agency (WMA) and was subsequently cast in her first Hollywood production, The Forbidden Kingdom. She played Golden Sparrow, an orphan seeking revenge against her parents' killer. Thereafter, she starred in romantic-comedy Love in Disguise (2010) opposite Taiwanese singer-actor Wang Leehom. In 2011, she starred in fantasy supernatural film A Chinese Ghost Story, adapted from Strange Stories from a Chinese Studio; as well as White Vengeance, a historical epic based on the well-known legend of Liu Bang and Xiang Yu of the Qin Dynasty. The same year, she was cast as Wu Qing (Emotionless) in Gordon Chan's wuxia film The Four, adapted from Woon Swee Oan's novel series The Four Great Constables. She subsequently reprised her role in two other installments of the film series. Liu won her first major acting award in her 11-year career, the Best Actress award at the 5th Macau International Movie Festival, for her role as Lingju and Diaochan in the historical film The Assassins (2012). In 2014, Liu collaborated with Korean actor-singer Rain for the romance film For Love or Money, based on Hong Kong novelist Amy Cheung's 2006 novel of the same name. Though it did reasonably well at the box office, the film was criticized for its storyline and production. She then starred in the American-Chinese action film Outcast (2014) directed by Nick Powell, alongside Nicolas Cage and Hayden Christensen. Liu starred in another Chinese-South Korean co-production, The Third Way of Love (2015), a romance melodrama co-starring Song Seung-heon. Her performance in the film led to her win for the Most Anticipated Actress award at the 16th Chinese Film Media Awards. The same year, she was named the first Chinese ambassador of Dior Prestige and became the global ambassador of Tissot. In 2016, Liu starred in romance film Night Peacock, a Chinese-France co-production directed by Dai Sijie. The film was awarded first prize under the Special Chinese Film category at the 40th Montreal World Film Festival, and Liu was nominated as Best Actress. She then starred alongside Kris Wu in the youth romance film Never Gone. In 2017, Liu starred alongside Yang Yang in romantic fantasy film Once Upon a Time by award-winning director Anthony LaMolinara and Zhao Xiaoding. She also starred in the historical film The Chinese Widow directed by Bille August. The film premiered at the Shanghai International Film Festival as the opening film, and Liu was nominated as Best Actress. The same year, Liu reunited with White Vengeance co-star Feng Shaofeng in the fantasy comedy film Hanson and the Beast. In November 2017, Liu was cast as Mulan in the live-action adaptation of the 1998 Disney animated film, which is set to be released in 2020. In December 2017, it was announced that Liu will star in the upcoming fantasy mystery television series, The Love of Hypnosis. This marks her first small-screen comeback in 12 years. Liu Yifei signed with Sony Music Entertainment Japan in 2005. She released her first Japanese single "Mayonaka no Door" with Sony Music on July 19, 2006. Her debut album Liu Yifei was released the next month in various parts of Asia such as mainland China, Taiwan, Hong Kong and throughout Southeast Asia, featuring a diverse music repertoire including rap and soft rock. In the same year, Liu also released her Japanese album in which the single, "Mayonaka no Doa" was chosen to be the theme for an animation series Demashita! Powerpuff Girls Z by Tokyo TV. ^ a b "签约日本索尼音乐总部 刘亦菲息影进歌坛". Tencent (in Chinese). June 28, 2005. ^ a b c "Crystal Liu Yifei: seven things you don't know about the Chinese actress playing Mulan". South China Morning Post. December 1, 2017. ^ a b "美了多年的刘亦菲一直是那个神仙姐姐". Sina (in Chinese). March 4, 2016. ^ "80后评新四小花旦 黄圣依杨幂王珞丹刘亦菲获封". Sina (in Chinese). April 29, 2009. ^ a b Sun, Rebecca; Ford, Rebecca (November 29, 2017). "Disney's 'Mulan' Finds Its Star (Exclusive)". The Hollywood Reporter. Retrieved 2017-11-29. ^ "劉亦菲成長照片曝光 跳新疆舞美若天仙" (in Chinese). People's Daily. November 30, 2005. ^ The "茜" (Xi) in her former name comes from the German film Sissi (Chinese translation 茜茜公主—hence the pronunciation of xi, not qian; her mother calls her Xixi). ^ "神仙姐姐 劉亦菲" (in Chinese). Xinhua News Agency. July 29, 2004. ^ "Impact is imminent". China Daily. May 6, 2008. ^ "揭秘刘亦菲富豪"教父" 中国首富榜排23". NetEase (in Chinese). May 7, 2008. ^ "刘亦菲"富豪继父"真实身份揭秘". NetEase (in Chinese). May 6, 2008. ^ "芳邻刘亦菲". Sina (in Chinese). October 22, 2006. ^ "《金粉世家》走出王语嫣 15岁刘亦菲一步登天(图)". Sina (in Chinese). July 26, 2002. ^ ""民国戏"热荧屏 张恨水最有电视缘". China.com (in Chinese). June 7, 2007. ^ "<金粉世家>创收视新高 陈坤董洁成最佳情侣". Sohu (in Chinese). May 10, 2013. ^ "刘亦菲对《天龙》充满自信 自言气质像王语嫣(附图)". Sina (in Chinese). August 13, 2002. ^ "《天龙八部》台湾收视第一 网民支持率超过内地". Sina (in Chinese). February 2, 2004. ^ "《仙剑奇侠传》改编之同名电视剧带来收视狂潮". Sina (in Chinese). July 7, 2005. ^ "《仙剑奇侠传》大结局 刘亦菲摆脱花瓶形象". Sina (in Chinese). June 21, 2005. ^ a b "Rising star ready to shine". China Daily. February 11, 2011. ^ "張紀中定"新俠侶" 金庸贊"小龍女"" (in Chinese). People's Daily. July 13, 2006. ^ "刘亦菲版"小龙女"深入民心 《神雕侠侣》重播". Sina (in Chinese). April 27, 2007. ^ "刘亦菲惊艳金鹰开幕式 李宇春演出破性感尺度". NetEase (in Chinese). October 28, 2006. ^ "When Jackie Meets Jet". Asia One. May 2, 2008. ^ "王力宏携手刘亦菲 处女导《恋爱通告》热拍中". Mtime (in Chinese). March 4, 2010. ^ "Classic film to be remade by director of Ip Man". The Global Times. July 5, 2010. ^ "Liu Yifei Inhales New Role". China Radio International. April 8, 2011. ^ "Not so awesome foursome". The Global Times. July 30, 2012. ^ "《四大名捕2》刘亦菲：恋爱的女人脆弱". Sina (in Chinese). October 18, 2013. ^ "《四大名捕3》定档8.22 邓超刘亦菲再战". Sina (in Chinese). July 23, 2014. ^ a b "刘亦菲凭《铜雀台》封后"澳门国际电影节"". China Daily (in Chinese). March 25, 2013. ^ "刘亦菲诠释"最落魄"貂蝉 《铜雀台》绝美依旧". Mtime (in Chinese). September 13, 2012. ^ "For love of money". Sina. November 17, 2014. ^ "Liu Yifei joins Nicolas Cage in new film". China.org.cn. August 30, 2013. ^ "Liu Yifei, Song Seung-Heon collaborate in love story". China.org.cn. January 20, 2015. ^ a b "第十六届华语电影传媒盛典颁奖". NetEase (in Chinese). November 19, 2016. ^ "Liu Yifei Is The New Face of Dior". Asia Beauty. October 18, 2015. ^ "Tissot Announces Its New Female Ambassador". Tissot Watches. October 23, 2015. ^ "Director Bille August Interview". YouTube. July 20, 2017. ^ Clifford Coonan (February 8, 2015). "Berlin: France Setting the Pace On China Co-Productions". The Hollywood Reporter. ^ a b "Chinese films win big at 40th Montreal World Film Festival". The Global Times. September 7, 2016. ^ "'So Young' sequel to meet audiences on July 8". China.org.cn. July 6, 2016. ^ "Crystal Liu, Yang Yang paired in a fantasy romance". China.org.cn. December 24, 2015. ^ "Liu Yifei stars in The Chinese Widow for Zhejiang Roc Pictures". Blake Friedmann. November 17, 2015. ^ a b "Shanghai Festival: Danish Auteur Bille August's 'The Chinese Widow' to Premiere in Competition". The Hollywood Reporter. August 6, 2017. ^ "《南烟斋笔录》主演神秘揭面 刘亦菲井柏然出演". ifeng (in Chinese). December 19, 2017. ^ "刘亦菲首张专辑上海发布 破新人发片记录". Sohu (in Chinese). September 5, 2006. ^ ""小龙女"刘亦菲《放飞美丽》首张唱片就跨国". Sina (in Chinese). July 6, 2008. ^ "《五月之恋》刘亦菲和陈柏霖 演绎浪漫的爱情". Epoch Times (in Chinese). July 8, 2004. ^ "刘亦菲林志颖《恋爱大赢家》". Sina (in Chinese). November 8, 2006. ^ "刘涛刘亦菲聂远贺岁剧《阿宝的故事》给狗捧场". Sina (in Chinese). February 7, 2006. ^ "刘亦菲成熟装扮现身 与刘青云一同出席晚宴". Xinhua News Agency (in Chinese). March 19, 2012. ^ "广州大学生电影节圆满落幕 刘亦菲最受欢迎". Sohu (in Chinese). December 16, 2016. ^ "2017年第九屆澳門國際電影節獎項提名名單". Macau International Movie Festival Official Website (in Chinese). Wikimedia Commons has media related to Liu Yifei.